Washington Department of Ecology: Eyes Over Puget Sound: We're feeling the heat! Eyes Over Puget Sound: We're feeling the heat! This week's flight was beautiful as we hopped between monitoring stations in the San Juan Islands, Bellingham Bay and the Whidbey Basin. Although sandwiched by rain, this uncharacteristically warm day really got us thinking about all of the anomalies we're seeing in Puget Sound as a result of the drought. 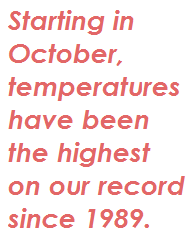 Starting in October, temperatures have been the highest on record since 1989. It's hard to imagine a drought when rain is falling throughout the week, but take a look to the mountains. That ominous lack of snow pack means lower and warmer rivers. We're already seeing the effect in Puget Sound. Yes, salinity and oxygen are much lower. Recent rains have rivers flowing high. Aerial views show dramatic sediment loads from rivers mixing into otherwise blue water. But don’t be fooled – by summer, glacier-fed rivers are expected to run significantly below normal, with implications for Puget Sound water quality. What happens when our rivers run low? Low flows can hurt salmon and change the ecosystem of Puget Sound. Our environment is incredibly connected. In this issue of Eyes Over Puget Sound, we have a special 10-page pop-out section to explain how snowpack, salmon, and Puget Sound are expected to be different in 2015 as a result of this record warm winter. For details, explore the special Drought Effects segment. Glimpse Puget Sound’s glacial history. Did you know that Puget Sound was carved by nearly mile-thick glaciers? The last one began to retreat 14,000 years ago. Don't believe it? Dive into this month's Personal Field Impressions section to learn more and see the clues that have been left all around our landscape. Check out our March issue. Our March issue is also full of spring algae blooms visible in some of the bays, and packs of jellyfish going strong in finger inlets of South Sound. Check it out! What's Eyes Over Puget Sound? Eyes Over Puget Sound combines high-resolution photo observations with satellite images, ferry data from travel between Seattle and Victoria BC, and measurements from our moored instruments. We use a seaplane to travel between our monitoring stations because they are so far apart. 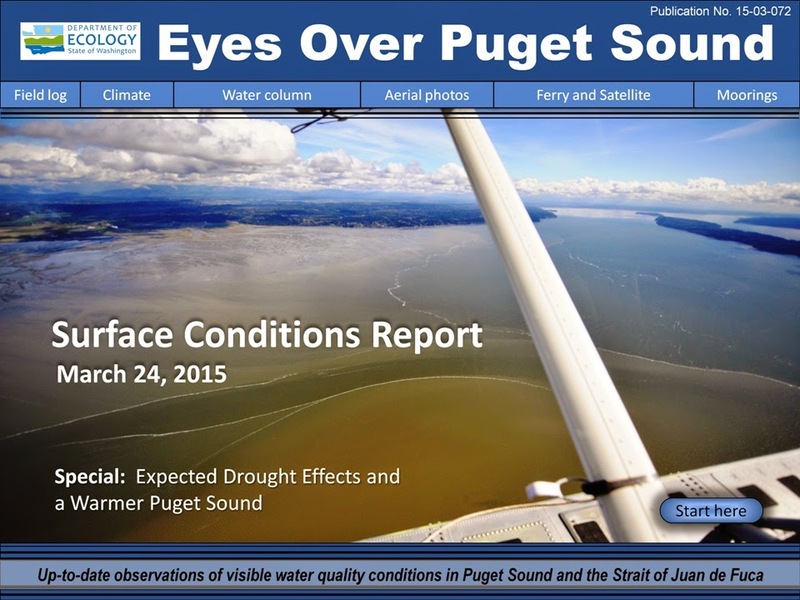 On each flight we take photos of Puget Sound water conditions and turn those out, along with data from our stations, in the monthly Eyes Over Puget Sound report. Learn more and see other issues on our website.